Muhammad Ali was notorious for his pre-fight teasing of opponents -- but in the run-up to his epic, era-defining "Fight of the Century" against Joe Frazier in March 1971, Ali's taunting veered from friendly ribbing to vicious, ad hominem assaults. He questioned Frazier's manhood, his "blackness," his courage, his intelligence. For his part, Frazier largely kept his mouth shut, and trained. And trained. And trained. When their title bout at New York's Madison Square Garden ended, Frazier had handily defended his championship crown -- knocking Ali to the canvas at one point with a thunderous left hook that, among many boxing fans, is still simply known as "The Punch." 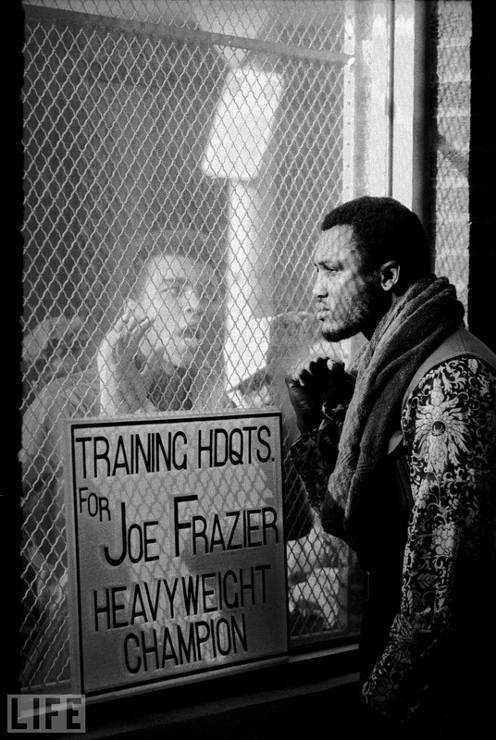 Here, in a perfectly symbolic image by LIFE's John Shearer, Ali clowns around during an unannounced visit to Frazier's training camp. For his part, Frazier barely deigns to even look at Ali, and instead offers one simple gesture: a clenched fist. Muhammad Ali era cunoscut pentru tachinarile oponentilor inainte de lupta - insa in perioada de varf, mai exact in lupta care poate fi definita ca "Lupta secolului" impotriva lui Joe Frazier din Martie 1971, tactica lui Ali era provocatoare trecand brusc de la sicane prietenoase la acele atacuri la persona vicioase. A pus la indoiala barbatia lui Frazier, originea, curajul, inteligenta. Pe partea cealalta, Frazier in mare parte si-a tinut gura si s-a antrenat. Si iar antrenat. Si iar antrenat. Cand s-a disputat titlul pentru care luptau, la New York Madison Square Garden, Frazier si-a protejat foarte bine centura - l-a doborat pe Ali, care a cazut in corzi la un moment dat, cu un croseu fugerator de stanga, care printre fani boxului este cunoscut ca "Lovitura". In fotografia de mai sus, intr-o imagine simbolica realizata de angajatul revistei LIFE John Shearer, Ali se maimutareste in timpul unei vizite neanuntate in sala de antrenament a lui Frazier. In partea cealalta a geamului, Frazier abia catadicseste sa se uite la Ali ci ii ofera, in schimb, un gest simplu: un pumn inclestat.